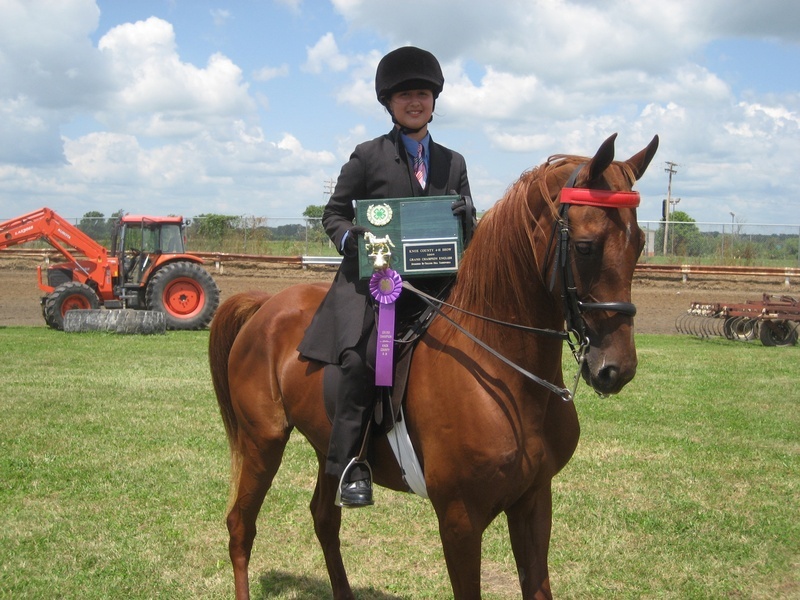 Irish Hills Farm raises quality American Saddlebred Horses. It has long been a passion to raise these beautiful horses. Saddlebreds are known as the "Peacock as the Showring". There is more to this breed. Saddlebreds are also known for their "people personality", versatility, competitive in more than one discipline, and are smart. To raise an excellent foal you need quality sire and dam. We currently stand Johnny's Little Patches, a bay/white tobiano. We will stand High Point's Ivory Coast, cremello, in 2011. Check-out their pages for more information. In our broodmare band, we have the following mares: The Champagne Duchess, Shimmer's Lady Naranda, Stonewall's April Ice, DRK Sassy Doll, Sultan's Fancy Jane and On the Wings of Angel . Click their name to learn more about these wonderful ladies. The Champagne Duchess, aka Flower, is a 1989 3-gaited chestnut mare. She is by Champagne Fizz (Supreme Sultan x Commander's Elegance) and out of Rose Bowl (Supreme Spirit x Esmeralda's Stoneridge Girl). Flower has 8 BHF's in her pedigree. She has many well know stallions in her pedigree including: Champagne Fizz, Supreme Sultan, Valley View Supreme 2x, Supreme Spirit, Genius Bourban King 2x, Anacacho Denmark, Anacacho Shamrock 2x, and Genius King 4x. Check-out her full pedigree by clicking below. Flower has 5 registered offspring with ASHA. Her offspring have been shown successfully in the showring. Stonewall's April Ice, aka, April, is a 2002 bay park/fine harness type mare. She is by Stonewall's Golden Baron (Stonewall's Gold Rush x Baron's Cat Dancing) and out of Ring's Ice Precious To Go BPS (Mississippi Iceman x Ring To Go). April has many well known horses in her pedidgree including: Stonewall's Gold Rush, Robert E Sea, Bobby Sea, Stonewall Sensation, Stonewall King, Anacacho Denmark, America Beautiful, Vanity's Sensation of Crebilly, Ch Primrose Path, Anacaho Shamrock, Fliration Walk, Ch Ridgefield's Genius, Moderation Creation, CH Rick Rack, Starheart's Peavine Supremium, Center Ring, Wing Commander, Stonewall's Victory, and a Belvideere line (starting with Belvideere's Golden Flicka). Check-out her full pedigree below. April's first foal was a National Show Horse for A Riesing. She produced a chestnut filly, Stonewall's Sire Call. See photos in the photo gallery of Siren. In 2012 April gave birth to a beautiful palomino filly with chrome, Ivory's Crystal Slipper. She has produced another very athletic filly. See photos under 2012 foals in the photo gallery. 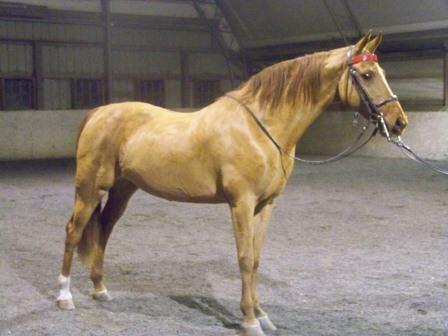 DRK Sassy Doll, aka, Sassy is a 2000 chesnut pleasure mare. She is by Inspiration's Choir Boy (Sultan's Treasury x Inspiration's Hi Lite) and out of Reebok's Darlin (Reebok x My Champagne Music). Sassy has BHF's in her pedigree. She has many well known horses in her pedigree including: Inspiration's Choir Boy, Supreme Sultan, Valley View Supreme, Champagne Fizz, Genius Bourbon King, Pinetree Denmark, Anacacho Denmark, Uptown Commander, Wing Commander, and Hide-A-Way's Firefly Supreme. Check-out her full pedigree below. favorite for Girl Scout Horse Day teaching Brownies and Daisy's. She made an appearance at the 2012 IL Horse Fair. 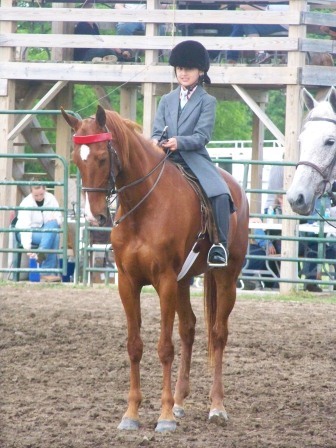 Elena and Sassy competed in the 2012 IL Horse Fair Queen Pageant. They placed 2nd in the Horsemanship Division. Check out their photos in the 2012 Queen pageant in the photo gallery. She was shown successful last 4 years by Elena J with many wins and ribbon placements on the open and youth show circuit. 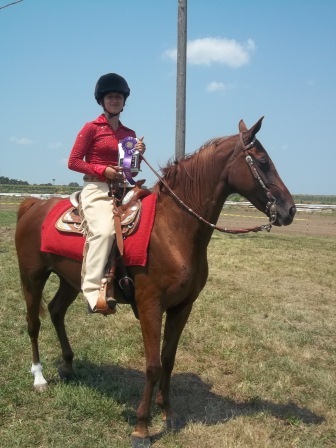 Elena and Sassy were the Reserve Champion Saddle Seat in 2012 at the IL Jr. Horse Show. Look for this pair again in the show ring in 2013. To see pictures of Elena and Sassy, check-out the photo gallery. Anna is in training this year and will be shown in 2011. (Truly Stonewall x Rambler's Fancy Denmark) and out of Lady By Day (Sultan's Great Day x Peavine's Little Lady). Jane has 8 BHF's in her pedigree. She has many well known horses in her pedigree including: Truly Stonewall, Sultan's Great Day, Royal Rambler, Supreme Sultan, Valley View Supreme, Stonewall Supreme, Sea Society, Bobby Sea, Center Ring, Wing Commander, Colonel Boyle, Genius Bourbon King, Stonewall King, Anacacho Denmark, and Ridgefield's Genius. Check-out her full pedigree below. Sultan's Fancy Jane is part of our show string. Jane and Thalia had a good show year in 2011 and 2012. Check out photos of this pair in the photo gallery. Look for this winning pair again in 2013. We will miss you Naranda!!! Shimmer's Lady Naranda, aka Naranda is 2003 chestnut/white tobiano mare. She shows the potential to be a nice gaited mare. She is by Shimmer (Chubasco x More Than Ever) and out of Naughty Naranda (Chubasco x Ch Naranda). Our Naranda has many well known horses in her pedigree including: Chubasco 2x, Ch Yorktown 2x, Wing Commander 2x, Spring Valley Deliverance, Night of Folly, Supreme Sultan, CH Hayfield's Noble Lady, Valley View Supreme 2x, Hide-way's-Firefly Supreme, and Ch Narnada. Check out her full pedigree below. Naranda has had Firelilly (bay filly) and Johnny B Goode (black colt) for us. See Photo Galleryfor pictures of her offspring.